Taking care of your Labrador puppies can be hectic, time consuming, frustrating, necessary but, above all else, great fun and a pleasure to those providing care in the cute little one's new home. Lab puppy care means taking care of a dog that by nature hates to be solitary. Labs find being on their own for long periods very stressful. However, labs, both as puppies and adult dogs will give their owners ten times as much love as the love shown to them. Labradors, especially pups, often become anxious when left alone. One way of helping your Lab pup avoid separation anxiety is to put his bed alongside your bed at night. This, understandably, is not for everyone. So you may decide to make your pup sleep in his own space, though you will have to try and ignore his yelps which are probably inevitable at first. But, should you decide to leave your Labrador pup on his own at night, he will soon become accustomed to it, treating his solitary sleeping space as his own refuge. At one time I would never have thought of using a crate for a dog of mine to sleep in. But, with a Labrador puppy I trained for a charitable organisation, the crate had to be used. The dog soon got used to it, and would go into her crate when she was ready for sleep. However, two words of warning. Firstly, the crate for even a medium sized dog is huge. I really had no idea about this and with only a small reception room in the house the crate took up an awful lot of room. Secondly, ensure the crate is placed in the same position each night. The only time the dog yelped at being left in the cage was when I altered its position by a few feet. Returning the crate to its original position soon stopped the yelping! Training is a very important part of Lab puppy care. The attention span of Lab puppies is very short, to say the least! Initially, keep training routines short, but playtimes will be long! Remember, your lab pup will only be able to concentrate and learn during very short sessions. 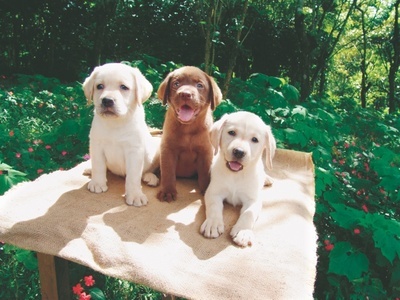 Labrador puppy care should also include training within the house, toilet training Labrador puppies is very easy. The puppy's bed, whether it is an indoor kennel or crate, will be rarely soiled. The Labrador pup will try and wait until he is taken from his sleeping base before undertaking his toilet duties. The young Lab should taken to the same place every day for his toilet and then praised after urinating and opening his bowels. With the best puppy in the world it should be remembered that until the Labrador pup is at least 6 months old there are likely to be the occasional toilet accident. When this happens there should be little or no fuss. The accident should be cleaned up and the puppy put outside. Lab puppy care also demands that the young lab should not do too much exercise on the lead until they are at least six moths old. Short bursts on the lead will be sufficient for your lab during those early weeks.